This prairie dress is going to be one of my favorites this season. But what is a prairie dress you might think. It is a longer flower dress, with puff sleeves and with a high closed collar, think: Little house on the prairie. I can luckely close this one as high, or low, as I want, because I do not like high-closed clothing. 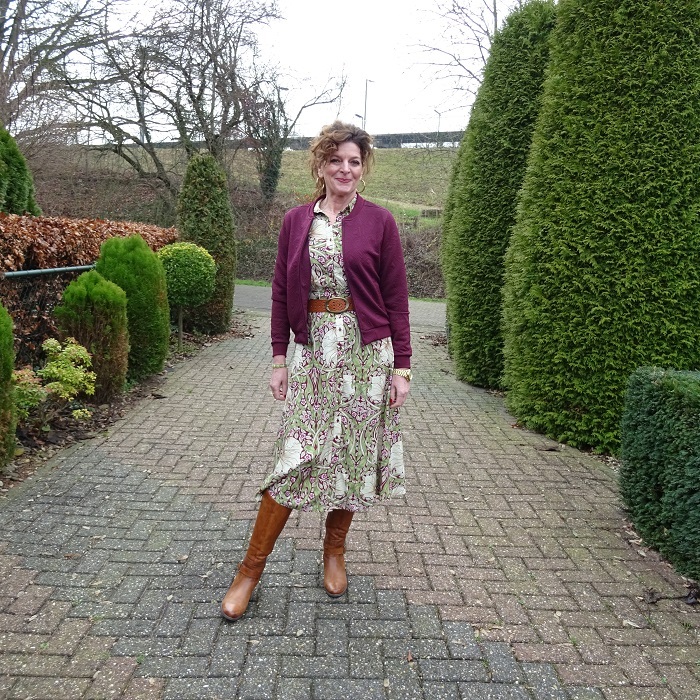 This dress is great with cool brown boots. It is such a lovely casual dress, but then just a bit more. A denim jacket,of course, no brainer, looks also very good on this dress. Shall I tell you how I got the dress? Gerben got a gift card from his work, as a Christmas package. This is a voucher that you can hand in at many different stores. I always get that card from Gerben! Sweet hey! And I had, very coincidentally, put two dresses in my basket on the h&m site. But the voucher was not valid there, So I watched where it was. And then I saw that it could also be exchanged at the supermarket where I always do the shopping. So I thought I would order the dresses and use the voucher for the groceries. But when I wanted to pay for the groceries with it, that did not work! I had looked wrong on the site, you could buy the vouchers there but not pay with them! So now I have two new dresses! But still a voucher! Haha, oh bad hey! I swear I didn’t do that on purpose. The color of this dress is actually to light for me. Darker colors look better on me. That’s why I wore this jacket on it. I prefer it better with a denim jacket, I will wear it in spring when I have a bit of a tint, with a denim jacket. 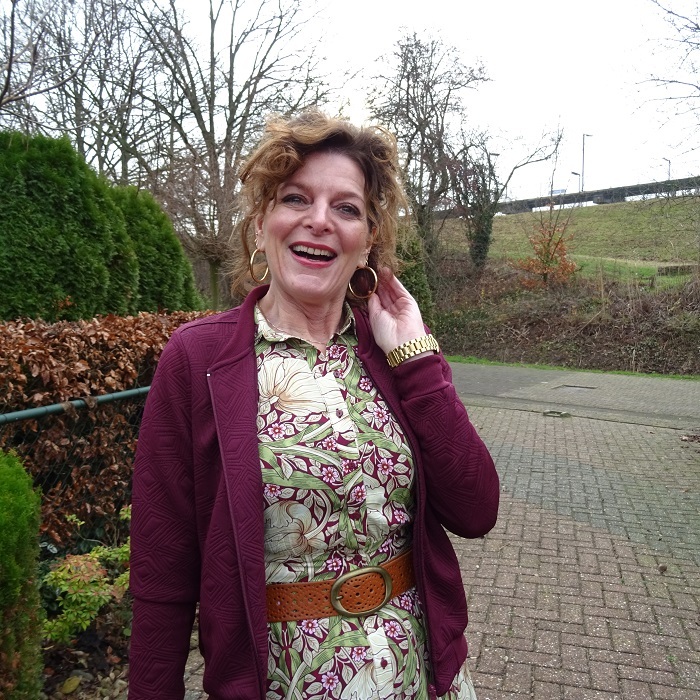 But this jacket works perfectly with the dress, it is also the right lenght, shouldn’t be any longer. I wear a leather belt in the same color as the boots and gold colored loop earrings. Are you in for the prairie dress trend? I just love this dress on you Nancy ! That is a fun story about the gift card though. Lol. Beautiful plum jacket too and dazzling style ! Good for you on trying the prairie dress trend, I’m not too sure about it for myself. The jacket is such a dynamic color, it was a great choice to add depth to your light dress. I’m not sure I believe you on the voucher-haha! Haha, oh that is bad Kim! Haha, or do you know me that well! Nancy you look amazing. I like you style it with cognac belt and boots. Such a funny story with the dresses! Not all bad if you got some dresses out of it, haha! Not bad at all! Hahaha. This dress is lovely! The cut and the print are just perfect. Your bright cardigan is so pretty with it too! Thanks Kellyann, it’s the perfect color to go with the dress! Your story cracked me up Nancy. That’s totally something I would do…and not on purpose either!! That’s such a gorgeous dress. Yeah right Jodie! Hahaha! Thanks. Loving your story and now you can enjoy another shopping trip with your gift card. As for the colour – well I thought it suited you. Yes, most of the colour is quite light but there is also a lot of plum in there. Looks like you could wear it all year round and not just in one season. Indeed, it is a very versatile dress! Thanks love! Excellent dress! And it looks great with the jacket. I’m on and off the prairie dress trend. Your voucher card story made me laugh. You’ll just have to keep trying to use it, like at, say, Gucci or Pucci! Hahaha. Hahaha, why didn’t I think of that! Really?? Love to see how you styled it! I think I will be getting myself a prairie dress once I’m spending again. It looks fun and feminine, which as we know is not me, and why id like to experiment. Thank you for showing us the trend. Are you not fun and feminine?? Haha, you are!! Love it–great boots, belt, & earrings, too. Oh goodness, these are a trend again? I remember them from the 80s/90s. I love the colours in this one – it looks amazing with the jacket. 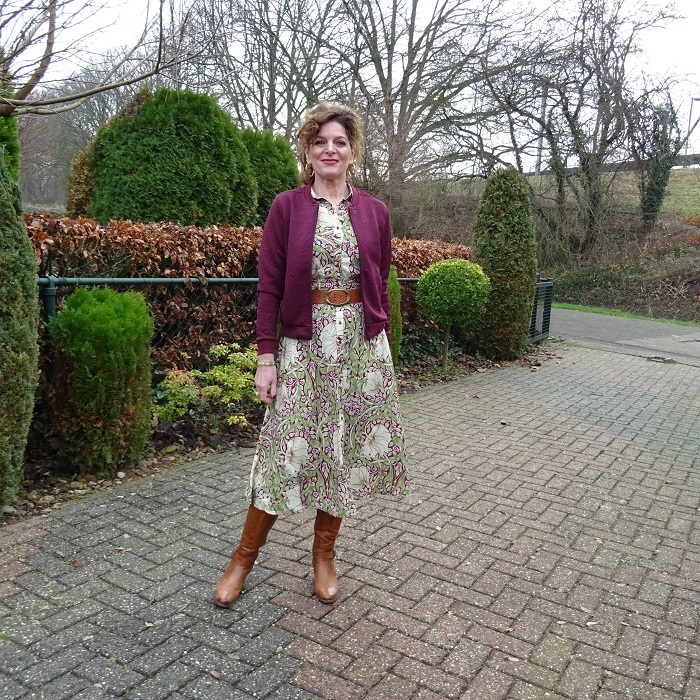 Great styling with the matching boots/belt, Nancy! Yes they are! Brings back memories hey! Thanks Sheila! I like how you paired the dress with the tan boots and belt! So pretty. I love the color combination in that outfit. I like the lighter overall coloring on you! AND how you balanced that with the darker cardigan and bookended your hair color with the boots. What a lovely look! I enjoy the longer look on others, but they never feel like me when I try them on, so this is a trend I will give a miss! Well we can’t follow every trend can we. And we shouldn’t. We only should wear what we feel most ourselves in! This is look for grown up woman – smart, sophisticated and feminine. Love it. Thank you for sharing with My Red Carpet. Serieus Nancy, ik had van deze trend nog niks gehoord! Shame on me! Leuk gecombineerd ook met het vestje! This dress looks amazing on you. the way you style what makes it special. 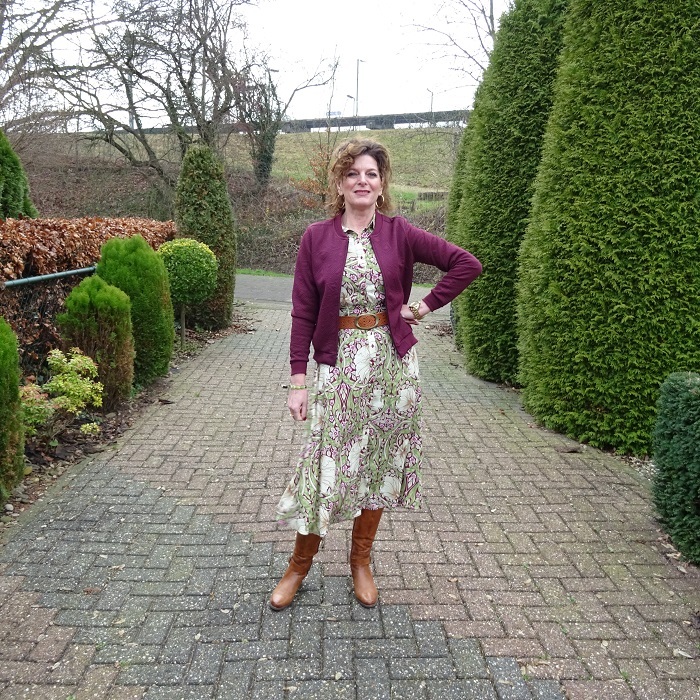 the color of your pin cardi and the boots and the belt are perfect color combination. I love these colors on you. You always create the most stunning looks with interesting color combinations….I never get very far out of my comfort zone with color, lol….but you’re helping me! Teach me your ways. Haha, I just wear what feels good to me. And sometimes I have girlfriends saying: What the hell are you wearing today? Well, if I feel good in it it works for me! Such a beautiful dress and I love how the cardi picks up some of the color in the dress. Oh, that gift card story is the story of my life. Whenever I try to be clever, it backfires! lol! Hahaha, sound like me love! Happy weekend! Oh dat is lief, dankjewel! Fijn weekend lieve Sabina! Loving the vintage vibe of this look dear. Such a chic dress you have there. Thanks for sharing at The Wednesday Blog Hop. Thank you Jacqui! I felt honored!